This sweet little white diaper set was hand embroidered in the Philippnes. 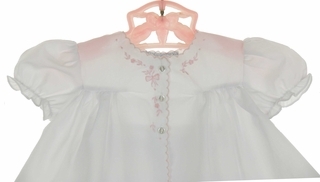 The swing style white top features delicate pink bow embroidery, with pink scalloped trim at the neckline and three button front closure. The short puffed sleeves are finished with elasticized ruffles. The matching diaper cover has an elasticized waist and ruffled elasticized leg openings for a good fit. Also available in white with blue embroidery and pale yellow with white embroidery. See below.